This type of link can be extremely dangerous to a website, and has pulled down the rankings of some of the biggest commercial sites on the internet! Commercial anchor text floods the target website; thereby ‘polluting’ the anchor text and making it look very unnatural to the Google Penguin algorithm. Site-wide links can come in many forms. They refer to a link which is duplicated on multiple pages – in many cases, across the whole website. You will typically find site-wide links in footers and sidebar blog roll links. They can occur as links to the homepage, or deeper sections of a site. Sometimes other types of link may be classified as site-wide links in link analysis tools such as Open Site Explorer, CognitiveSEO, or MajesticSEO. This is often because of pagination issues on websites, which can cause the link to appear many times, making it appear to be a site-wide link. If these pages are indexed in search engines, then they will view the link as a site-wide link as well. This is where things can get a bit tricky, as you will likely want to deal with these links differently depending on the website in question. Obviously manipulative site-wide links should be removed and disavowed at domain level. However, what if this is a website which you own, or a high quality website? If this is a website which you own and the site was created to manipulate Page Rank then you will probably already know the answer; remove the links and disavow the domain. We’d also recommend deleting the site completely as you don’t want a spammy website associated with you! If the site-wide link was manipulative, but misguided, and you wish to keep it to enable users to access your site, change the site-wide link to a nofollow. You may want to disavow the links as well to speed up their removal from the link graph, however be wary as adding a disavow at domain level will remove all link equity completely from the domain. In this example we can see a site-wide link on a site, where alarm bells should start ringing instantly if you are reviewing it for manipulative links. The site is heavy on advertising, has a poor design, and thin low quality copy and comments. 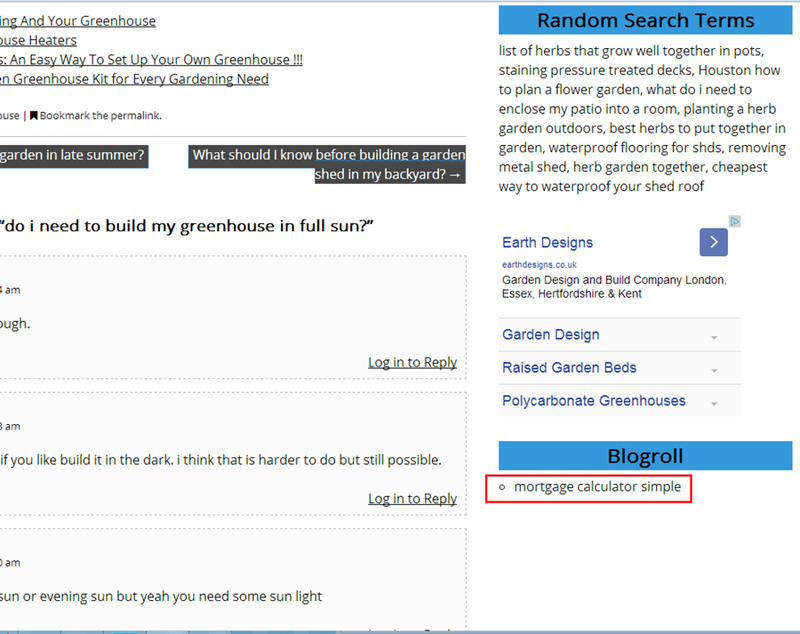 In addition, why would a website which is supposedly focused on gardening, be linking to a mortgage calculator?! The anchor text isn’t quite an exact match for commercial anchor text, but it’s pretty close; all you have to do is juggle the words around. Based on these observations, this is a manipulative link and should be removed and disavowed at domain level. Site-wide links can sometimes be hidden on the page so it is recommended to use our free Chrome Extension which will utilise the source code to identify where the link is, and with the click of a button take you to the location on the page. Helping the world tackle Google Penguin algorithmic and manual actions.... for free! Read our Google penalty expert blog, and if you feel like contributing and sharing your knowledge why not get in touch! Feel you can add something to the guide? Disagree with any of the advice here? Need help with a link? Add your contributions via Disqus, available on the bottom of every page.